How are those New Year’s resolutions coming along? Whether you’re trying to lose weight, eat more veggies, lower your carbohydrates, go paleo or gluten free; say hello to my little friend – spaghetti squash. This squash cooks into long tender strands like, well … spaghetti. I’m not going to tell you it tastes exactly like pasta because it doesn’t. But it’s delicious! The taste is sweet and mild, so this guilt-free spaghetti alternative is a perfect substitute in your favorite pasta dishes. The health benefits are significant with this nutrient-dense squash. You’ll get vitamins, anti-oxidants, fatty acids, minerals and fiber. Pasta can’t say that. One cup of cooked spaghetti squash has 42 calories and 10 grams of carbs, compared to 221 calories and 43 grams of carbs in one cup of cooked pasta. Does anyone eat just one cup of pasta? 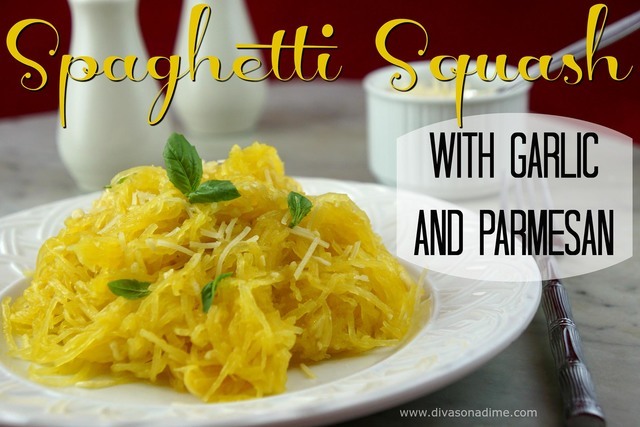 You’ll love that spaghetti squash is easy, inexpensive and versatile. Stock up when it’s on sale because it keeps for a month stored in a cool dry place and up to three months in the fridge. Choose squash that feels heavy for its size with no soft spots. A big yellow squash can look intimidating but I promise it’s easy to prepare. Like all hard-shell squash, the rind is hard to cut so the easiest way to prepare it is to bake it whole. Just pierce the squash a few times with a sharp knife and place the whole thing on a foil-lined baking sheet. Bake it in the oven at 375°F until it’s easily pierced with a knife. That’s 45 to 75 minutes, depending on size. Let cool, cut in half and remove the seeds. For faster preparation, roast in halves. Use a sharp knife to cut lengthwise and scoop out the seeds. Place it cut side down in a roasting pan. You can add a little water and cover with foil if you like, but it’s not necessary. Bake at 400°F for 30 to 55 minutes, depending on size. It’s done when it’s easily pierced with a knife. You can also microwave spaghetti squash. Slice lengthwise and scrape out the seeds. Place the squash cut sides down in a 9×13 glass baking dish. Add an inch of water and cover tightly with plastic wrap. Microwave the squash on HIGH for 15 minutes; check to see if the squash is thoroughly cooked. If not, microwave for five more minutes. Carefully remove squash from microwave and let stand until cool. After the squash is cooked, take a fork and scrape the squash to remove the spaghetti-like strands. As a side dish, I recommend tossing the strands in a simple sauce of minced garlic warmed in butter and olive oil, with black pepper and freshly grated Parmesan cheese as shown in the photo. As an entrée, spaghetti squash happily replaces pasta in your favorite pasta-based dishes. Try it with marinara, pesto, or alfredo sauces with chicken, beef or shrimp. A recipe for Spaghetti Squash Lasagna Boats waits for you on our website. Fabulous Food contributed by Patti Diamond from Divas On A Dime – Where Frugal, Meets Fabulous! Website and blog – www.divasonadime.com Join us on Facebook at DivasOnADimeDotCom.